Back with new stuff to please your plates! After a much needed vacation, and some great times with family, we are ready to get back on track for the rest of the growing season! Speaking of the rest of the season, we have a whole new line of great organic produce to bring to you all this week! Combine and chill for 30 minutes. Serve cold. So what’s new this week? From left to right: Fairy Tail, Orient Express, Raveena, and Black Beauty. 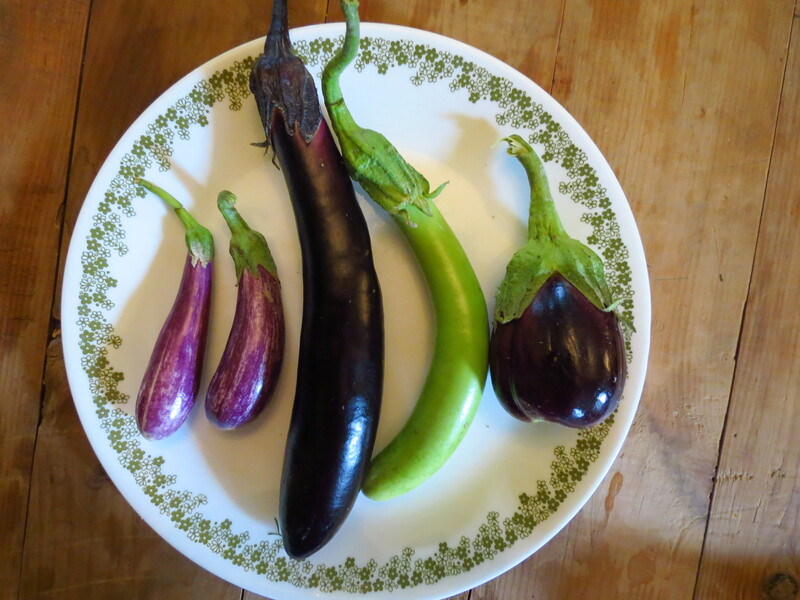 Eggplant will begin to appear on our tables as well as Okra, Peppers and serous amounts of TOMATOES!!!!!! I’m also excited to tell you that our zuchini and squash blossoms are ready to take a place at the table too! This evening I made a delicious pesto pizza for our crew! Add all ingredients to food processor and process on high until well mixed and there are no chunks left. You can freeze this pesto in ice cube trays for the winter months. Just fill your ice cube trays with the pesto and freeze. Once you have pesto cubes, you can pop them out of the tray and into freezer bags with the date and contents labeled. These cubes will make quick and easy meals for you later on! We will have plenty of basil for the rest of the summer! Our green beans are blooming, but I’m not sure we will see beans until next week. Lots of recipes, and new things to try!!! !